if i mention Einstein will you stop reading this? will it put you off? well, frankly, it’s too late for that because there he is, sitting fourth in line of the first sentence. and what’s more, here he comes again. Einstein had this theory that ’empty space’ can possess its own energy. those great big expanses of ‘nothingness’ filling up the gaps between the stars, or the gaps between and inside atoms – maybe they’re not empty spaces at all. for all we know about the universe, the things we observe on earth and in space, we think that we probably have a very rough awareness (not even an understanding) of about 5% of it. by our best, most contemporary estimates, we think that maybe there’s about 70% of the universe made up of this mysterious force we call, for want of a better term, ‘dark energy’, and 25% of a mysterious material we call ‘dark matter’. for me, there’s a parallel here with art. we make art to explore and express the great mysteries of the unknown. artists are out there, in the big open expanses of ‘the universal void’, scrambling about in the dark, piecing things together out of materials and non-materials to try and shed some light on our reality. dark matter_dark energy is a constellation of artists who reflect this way of thinking about art practice. each, in their own unique way, with their own unique approaches, grapple with the unknowable void and the forces and materials that make it up. and the reason for bringing their work together into a curated group show format is to play further on that idea of ’empty space possessing energy’. because in a group show situation, sitting between each work in the gallery, is a vast openness of space. the actual paintings, sculptures and screens take up about 5% of the gallery. it’s the in-between space where the audience walks around, where the lights cast their illuminating glow and the ideas about the works bounce off each other, combine, repel and play, that constitutes the 95% of ’empty’ space made up of something not unlike dark matter, dark energy. in quantum theory (now if Einstein didn’t put you off, i hope quantum physics won’t either) there’s a thought that maybe dark energy is actually a big mess of particles that continually form and then disappear. imagine that, trillions upon trillions of particles popping into existence, only to instantly disappear again. constantly. like ideas. another thought is that maybe it’s a type of liquid that we haven’t figured out how to measure. or maybe a field, like magnetism. dark matter, on the other hand, seems more likely to be some sort of actual material, just not detectable to our instruments. one of the theories is that it’s particles called … i love this … ‘weakly interacting massive particles’ (WIMPs). anyway – let’s get back to art here. this isn’t a science essay for crying out loud. (in space, no one can hear you scream). here’s my take on the works of each individual artist, and why i see a relationship to the ideas above. each artist has their own ideas, of course, and their own expectations about what they’re doing. like distant galaxies working their own orbital fields of planetary combinations. i’m just one observation point, trying to decipher the patterns in the void. what volume of space is death? what empty hole is left by a life dissolved? Michael has taken a casting of the depression left in the ground when a grave site sinks into the earth. his sculpture is an absence made present. this is a void made material. he’s presented it like a relic, a museum piece, as if it’s a casting from the print of a dinosaur or the inside of a sarcophagus. it’s a monument, and it’s monumental. and yet, the grave from which it was taken, is unmarked. an unknown death. an unremarked absence. Michael’s use of dental plaster reinforces thoughts of the human body. while the sculpture is a material translation of a hole in the ground, a sort of landscape art, it’s also a sort of portrait. and in death, it’s not uncommon to turn to dental evidence when in need of attributing an identity. 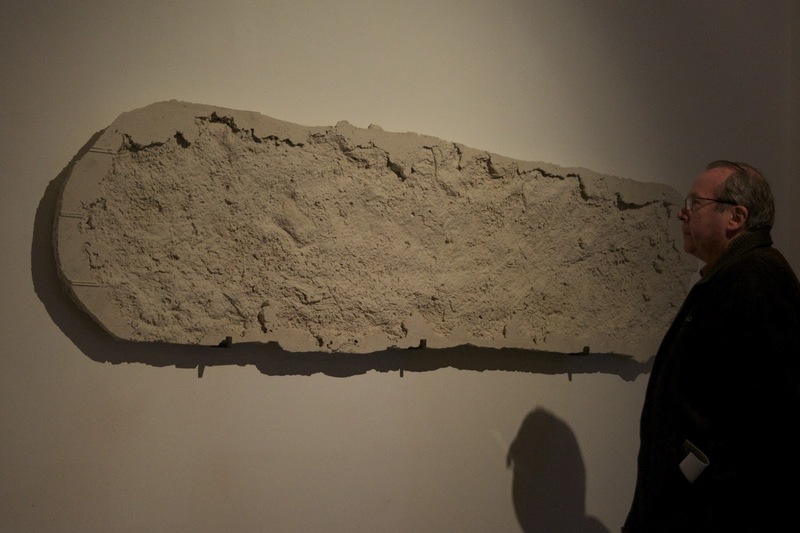 the plaster itself, with its bubbling, rippling and also eroded feel to it, evokes the landscape. not unlike sandstone or limestone it’s like rock formations you see at beaches and along coastlines. and this tension between landscape and portraiture spins off ideas about belonging to the land, of being part of the land – dust to dust, we are all made of stars. the darkly psychological portraits that Nicholas produces speak of the inner depths of the human mind. in the same way that some philosophers claim our grappling for knowledge about the universe is simply a grappling of knowledge about ourselves, these portraits reflect the unfathomable recesses of the psyche. the subjects in the paintings emerge from shadowy backgrounds, their outlines obscured by the darkly rich layering of oils. their facial features blend into their surroundings, and their surroundings become palpable. the shadows, the backgrounds, they become material. heavy, soupy atmospheres. staring into portraits is always in some sense staring into reflections of ourselves. we’re hardwired to look for signals in the human face, for recognisable familial traits and for symbols of communication. having sat with the portraits for a little while now, i’ve been noticing their changing characters. from different angles they seem either sad, haunting, frightening or melancholy. the way in which they’re painted means they’re almost alive as you move about the gallery space. and with three together on the wall there’s a whole assortment of relationships or communications between the group that you can’t help but wonder about. what are they whispering to each other when i’m not in the room? Sally uses light as if it’s a material entity. and then there’s gravity. oh, we mustn’t forget there’s also electrical energy. the precariously teetering form is an exercise in balancing force. 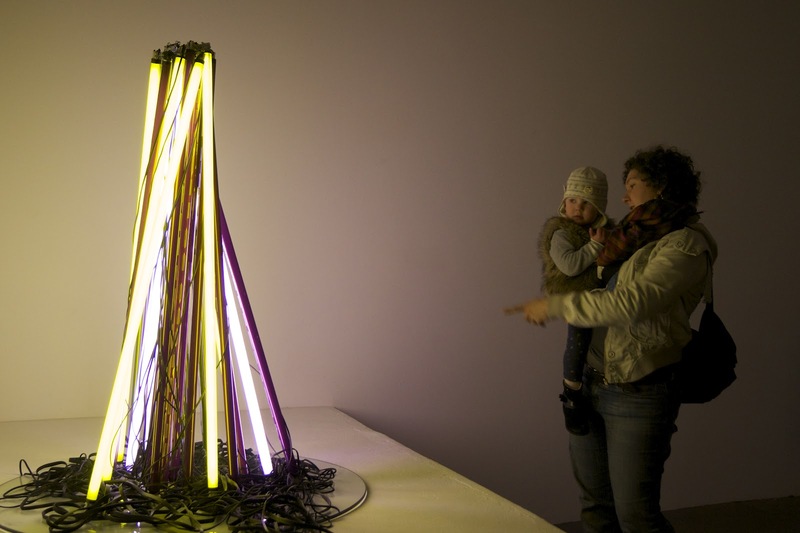 there’s a precarious and tense balance between tangible and intangible materials – a cone of fluorescent tubes and the weight of light that cone produces around itself, electrical cabling that supplies both physical support and pulses of energy, gravity that pulls it all together while all the while trying to pull the whole thing down. light changes the atmosphere of the space, blurring the hard boundary of the gallery walls and emitting a glow that dyes the air with energy. and you’ll have to enter the rest of the show through this luminous fog and be bathed by it on the way out. the cyclical nature of universal forces, of destruction and creation, are poetically expressed in the throbbing plumes of smoke of Verge 2. floating in an expanse of endless white, looping infinitely like a breathing galaxy, the beauty of this video work is in its simplicity. a simplicity of complex relations. 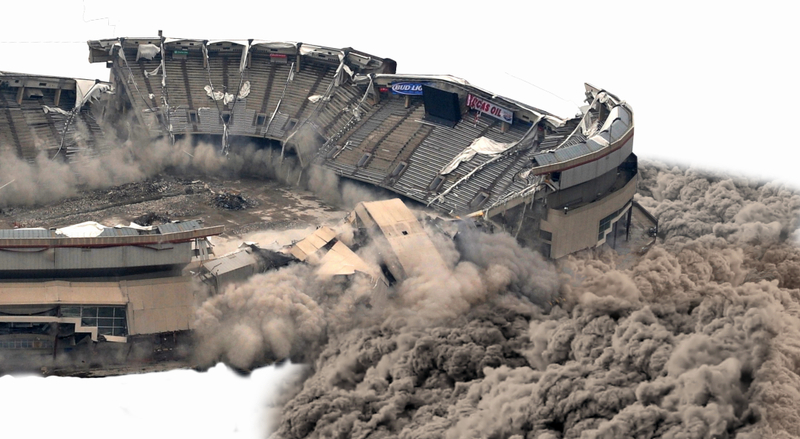 a stadium is destroyed. a circular platform for viewing. In the centre of any given stadium is where the action traditionally takes place. the field of play. some 20-odd human bodies, jostling about, like a molecule of different atoms. Following rules, behaving collectively, behaving competitively. and yet around that open field, sits thousands of spectators. observers whose very act of observing influences the outcome of play. oh look, it’s our old friend, quantum mechanics again. and here we are, watching it all on a screen. spectators observing the destruction of a spectator structure. on a spectator structure. A destruction now rendered as a creation. nothing quite fills an empty void like sound. rippling waves of air pulsating across the room, tickling the hairs inside your ears. when you think about it, sound doesn’t exist in the air. only little waves in the air exist. that noise we hear – that’s only inside our brains. 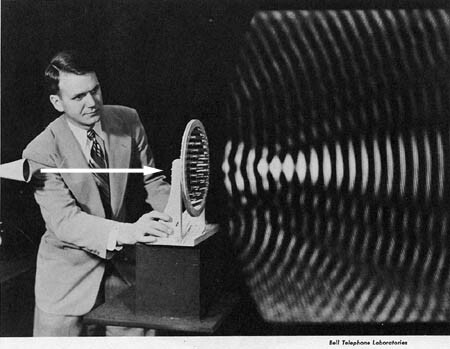 that’s our brain translating vibration into tone. the ‘sound’ is only inside our heads. In 1916 Einstein suggested that there is no such a thing as empty space. Similarly John Cage’s 4’33” (1951) was about lack of silence. Even black holes emit a sound – the sound of B flat, 57 octaves lower than middle-C, is rumbling away from a supermassive black hole in the Perseus cluster. So this piece is also about lack of emptiness. When discussing the “empty” universe (Dark Matter & Dark Energy), astro scientists talk about MACHOs (massive compact halo objects) and WIMPs (weakly interacting massive particles), but I have uncovered LAMBS (lucid aggregates of mobile baryonic sounds), and these form the basis of my piece. Granular synthesis of white noise is the main source producing both particulate and continuous sounds, but is interrupted by the throbbing of B flat, the note detected in black holes (although here it is 54 octaves higher (29.135Hz) to make it audible, and is modulated by a couple of other sine waves). A Higgs-like glissando makes a brief appearance on the Bose-on sound system. Adam’s cluster of sculptures on the floor reads like a constellation of phrases arranged in a chemical molecule. if you move any one of the component parts the force that binds them as a unit is disrupted and realigns with a new feeling that fine-tunes an effect in your stomach. balance is temporally important, temporarily. always undercut by a force that appears as both an archive of its action and the tension of its reappearance. the cluster sits as a mini-reflection of the whole show. centred in the space, an arrangement carefully placed, it is a pattern of a pattern. 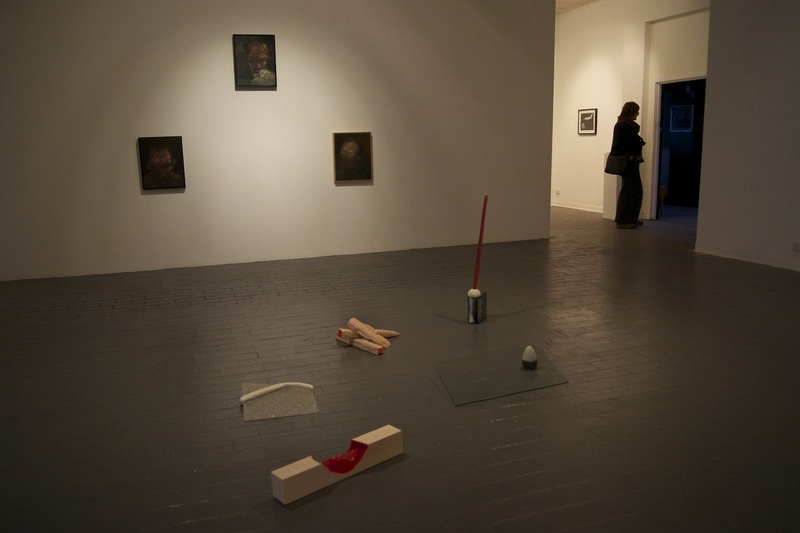 an echo of the placement of 6 artists’ work in the gallery. a fractal of a pattern of a resonance. the hand of the individual artist is also ever present. these are objects that have been conspicuously acted on. the hovering ghost of the hands laid upon these forms is in the room. and the probability of more clumsy hands about to get at them lurks in the shadows. Tags: Adam John Cullen, Jacques Soddell, Michael Needham, Nicholas Ives, Sally Blenheim, Stockroom Gallery, Tristan Jalleh, _EXHIBITION ESSAYS. Bookmark the permalink.